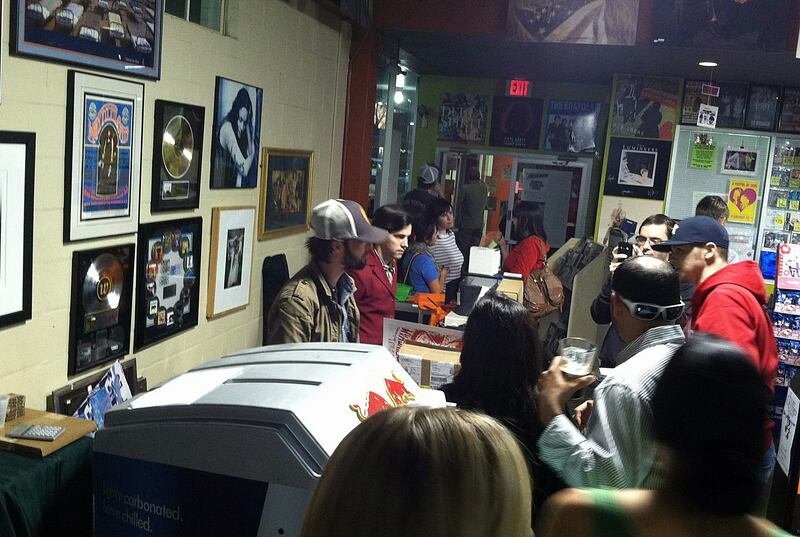 There’s Ryan Bingham in Houston, back there with the gimme cap. Bingham is, of course, the Academy Award-winning writer and singer of “The Weary Kind,” from the movie Crazy Heart, and the latest in a long line of fine singer-songwriters of the Texas tradition. This was a bit of a homecoming for Bingham, because he spent his high school years in Houston before taking off to join the rodeo circuit. People in Houston kill me: this capacity show at the record store (complete with firemen on hand, ostensibly to prevent too many people breaking the fire code) required a purchase and a bit of trouble to enter. Still, there were pockets of people who’d rather stand and gab with their bros and ugly girlfriends, instead of relinquishing 30 minutes of attention to this fine artist. Bingham seemed to sense this, so his set at Cactus was a bit shorter than the one he performed the day before in Austin. Bingham took some time to meet the fans and sign autographs afterward. The people who really were there for the music were early and up front, one even offered Bingham a swig from his whiskey flask which the singer happily obliged. The payoff was a rollicking version of early song “Bread and Water” with the lyric “Houston always brings me down” delivered with a big smile from Bingham. 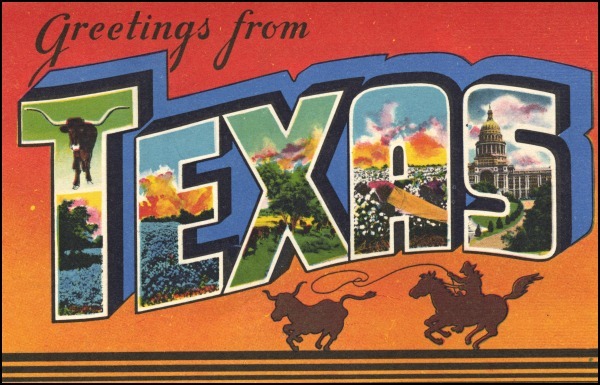 We didn’t get the surprise treat that Bingham offered the Austin audience, a cover of Robert Earl Keen’s “The Road Goes On Forever.” But you can see it on the YouTube video below, at about the 36:30 mark. If you want to see Bingham with his full band, he plays March 10 in Houston at House of Blues. Or catch him at another tour stop, click here for a list. 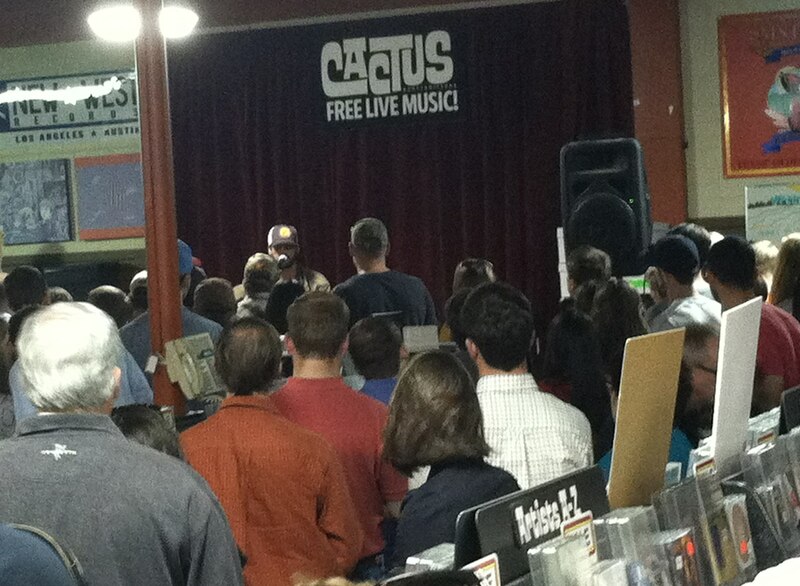 YouTube: Ryan Bingham plays an in-store at Waterloo Records, Austin, 1/31/2013. Thanks to Bob Knauf for the video. 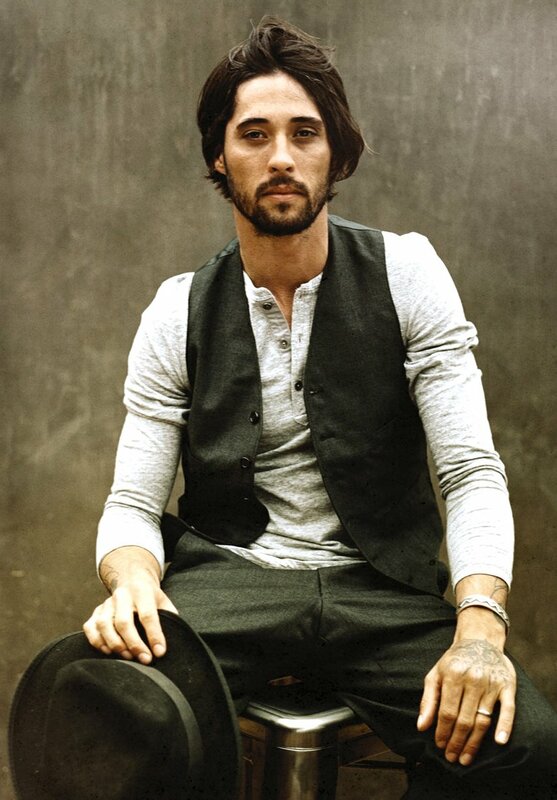 The world got to know Ryan Bingham when he won an Academy Award for “The Weary Kind,” from the movie Crazy Heart. The Texan has a new album, Tomorrowland, coming out Sept. 18, and the first single “Heart of Rhythm” promises a rockin’ good time. Academy Award-winning actor Jeff Bridges has a new self-titled album, out today. Über producer T-Bone Burnett twirls the knobs on this one, and it features two songs by the late Texas singer/songwriter Stephen Bruton, who also wrote some of the music for Bridges’ movie Crazy Heart. In fact, the first single “What A Little Bit Of Love Can Do” is a Bruton composition and in this video Bridges is joined by fellow Oscar winner Ryan Bingham on vocals, T-Bone Burnett and Buddy Miller on guitar and bass player Dennis Crouch. No word on the identity of that dancing dude at the end. Ryan Bingham is ridin’ high this year – this spring he won an Academy Award for “The Weary Kind” (from Crazy Heart) and this video, taken during an in-store performance in California, was taken just a day or two after the Oscar celebration. Ryan performs “Hallelujah” from his new album Junky Star, produced by T-Bone Burnett and which will be released next week. Review: Jerry Jeff Walker, Vampire Weekend, etc. 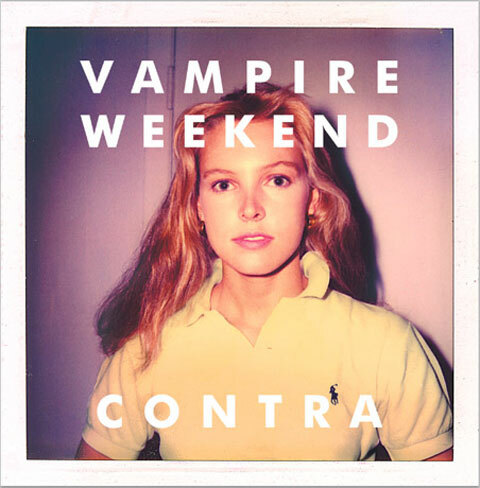 Vampire Weekend is just about the whitest band around, but they sure don’t sound that way. On Contra, this New York quartet picks up the sprightly rhythms of African music (and on a song like “Diplomat’s Son,” reggae … is this an homage to the Clash?) and swirls them into an intoxicating blend of wordplay and jumpy dance hooks. If you liked their first record, the boys (led by singer/guitarist/songwriter Ezra Koenig) haven’t strayed far from their roots, and that’s a good thing. 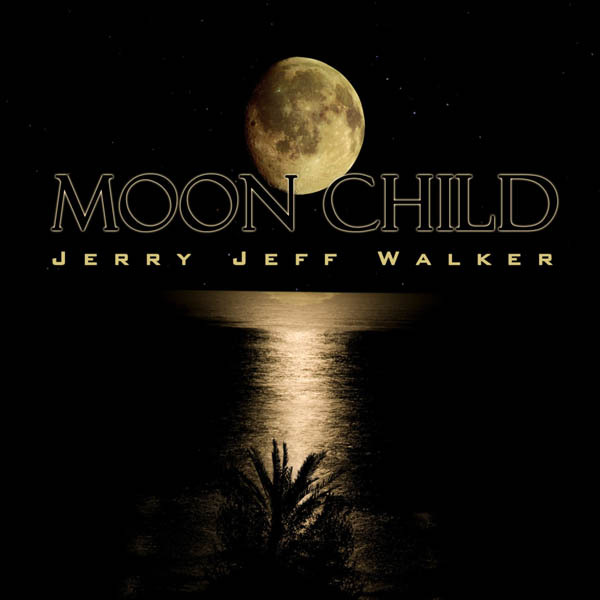 Jerry Jeff Walker is one of the legendary songwriters from Texas (although like Vampire Weekend, he’s a New York native) and Moon Child is his latest release. 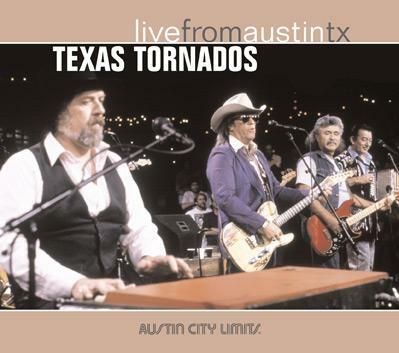 It’s available only online, at Jerry Jeff’s website and from iTunes and Amazon.com. 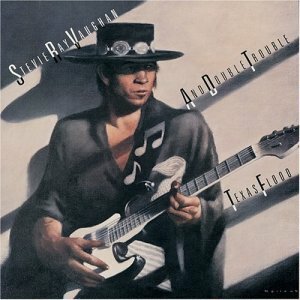 Jerry Jeff wrote about six of the 11 tunes here, the rest are by Jimmie Dale Gilmore and others including a version of John Denver’s “Back Home Again.” Jerry Jeff’s trademark is the bowed-but-not-broken survivor, looking forward with a peppy outlook: “The Poet Is Not In Today” fills that prescription. Moon Child is a decent dose of sunshine from a Texas treasure. Ryan Bingham is a Texas singer/songwriter whose work we’ve been digging for a little over a year. He might be ready to break it big on a national basis, with “The Weary Kind,” a song from the new movie Crazy Heart. Already Oscar talk has buzzed around star Jeff Bridges, and Bingham hisself might even show up on a nomination list for “Best Song.” The movie also stars Robert Duvall and Maggie Gyllenhaal and T-Bone Burnett handles the music direction. Crazy Heart will get a gradual opening over the next few weeks, and it should be at a theater near you by the beginning of February.